The new Roberto Coin Pois Moi collection marries modern design with vintage sensibility. 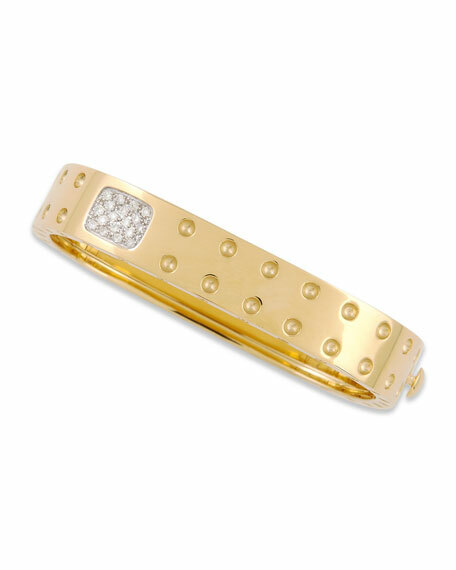 For instance, the refreshing, softly squared shape of this bangle is inspired by television monitors of the 1950s. From the Roberto Coin Pois Moi Collection. 18-karat yellow gold shapes squared bangle, 62mm x 52mm. Pave white diamond detail; GHSI; 0.28 total carat weight. Roberto Coin signature hidden 0.3 carat ruby. Two rows of rivet details. The Roberto Coin brand was born in 1996 when Coin, driven by his innate love for the world of art and fashion, decided to leave his career as a successful hotel manager to follow his dream and face a new adventure. Perpetually reinventing his personal style, Coin produces more than 600 unique jewelry models annually. Each piece is finished with a signature touch a small ruby, dedicated as a secret gift of good wishes from the designer.